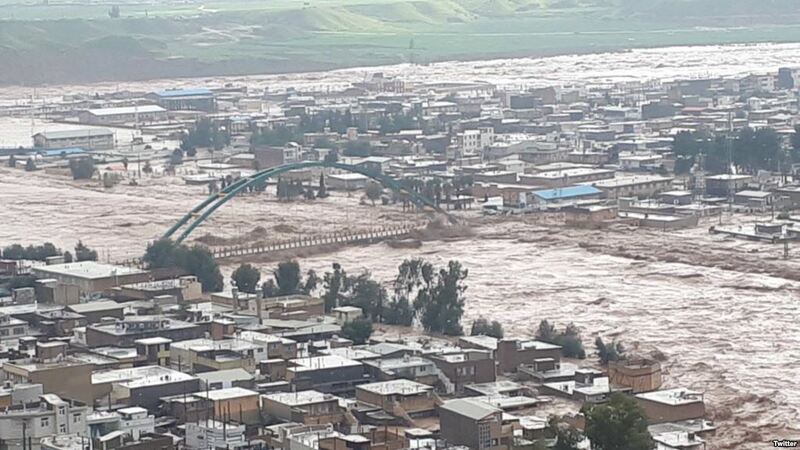 Floods in Pol-e-Dokhtar in Lorestan Province, western Iran, April 1, 2019. The town is now cut off. A Revolutionary Guards commander has declared that “people are in rebellious mood” amid floods across Iran that have killed at least 47 people. The commander of Guards ground forces, Gen. Mohammad Pakpoor, denounced government efforts in Lorestan Province in western Iran, where a state of emergency has been declared. He said “there is no management” in rescue and aid operations and “no government official would dare” show up because of residents’ anger. “People are in a sorry state and conditions are bad,” said Pakpoor. President Hassan Rouhani and the Revolutionary Guards have feuded throughout the two weeks of flooding, which began in northern Iran after heavy rains and spread throughout the country. The Guards’ chief commander, Maj. Gen. Mohammad Ali Jafari, was already blaming Iranians for electing Rouhani in 2013 and re-electing him four years later: “It’s the people who should have made the right choice. They are the ones who need to act with watchfulness.” The President and his officials were chided for not acting quickly enough and for failing to coordinate a response. Rouhani hit back by criticizing the Guards for ineffective operations, such as the demolition of a railway in northern Iran to ease the flooding: “It was like taking water from one bowl and pouring it into another.” Without naming the President, Jafari derided the “accusation”, said Government agencies have failed to help, and promised further demolitions. This week authorities issued new warnings for 10 of 31 provinces, saying more than 60,000 homes have been damaged — 25,000 of them destroyed — by the flooding. More than 150,000 people were evacuated from cities in Lorestan. Thirty villages have been submerged and 50 evacuated in Khuzestan Province, and the rail link between provincial capital Ahvaz and Tehran has been cut. On Monday afternoon, contact was lost with Pol-e-Dokhtar, a town in Lorestan with about 25,000 people. Just before the cutoff, a resident said in a video that two-thirds of the town is “under several feet of water”. Lorestan’s governor said if extraordinary efforts were not made to send rescue workers and aid, “we will witness a great human tragedy”. Water levels in Khorramabad, the capital of Lorestan, have reached 3 meters (9 feet).